How can you go wrong with a name like Radio Rodent? Whether you?re talking about a horror movie or remote controlled cat toy, the name conjures grand metaphors of a technological age gone feral and rabid. Like the product copy states, “Radio Rodent is on the loose! Experience wild and crazy radio controlled fun! Indeed. If your idea of playing with your cat involves chasing it around with a robotic mouse with glowing eyes, this device is for you. Radio Rodent?s tail rotates and his eyes light up a ?sinister red,? and he moves forward, backward, right, and left at the push of a button. And why is the remote controller shaped like a cheeseburger? We have no idea! Buy it here for $18.99, the mere price of a few pounds of cheese. Why we haven’t seen more wireless headphone integration with MP3 players is frustrating and confusing, but there are a few options out there if you’re willing to track them down. The FunTwist D-Chord 800 presents a digital audio player with Bluetooth-enabled headphones. Forthcoming in editions of 256MB, 512MB and 1GB, the player is equipped to handle MP3, WMA, and WAV files, as well as FM radio reception and recording. Buy it here, in its 512MB version, for AUS$249. It doesn’t appear to have surfaced outside of Australia yet, but it?s only a matter of time. The dream of having a real R2 unit of your own has gotten a little closer. This voice activated R2-D2 responds to over 40 voice commands and has an infra-red sensor that allows the droid to follow you around. It can also be set to detect motion, turning R2 into a room sentry that sounds an alarm when a secured area is invaded. The unit also replays sounds and dialog from “Star Wars” movies, answers yes-or-no questions, and dances while playing the cantina theme. Unfortunately, at six lbs and 15″(h) x 7.5″(w) x 10.5″(l), it’s only about half the size of our favorite robot. 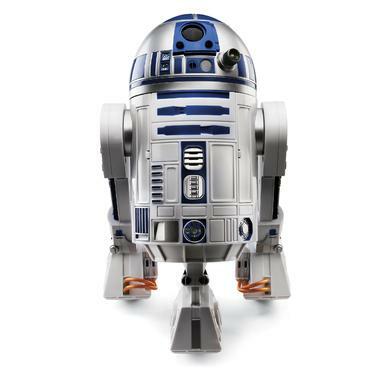 However, this R2 does have the lights, swiveling dome top, and distinctive happy and sad sounds that mimic the real thing. He’s even programmed for an occasional “bad mood” (a simple command of, “R2, behave yourself!” snaps him out of it). Buy it for $119.95 at Hammacher Schlemmer. By productdose on 09/26/05 • Leave a comment! The Internal Rolex consists of a Rolex replica encased in leather, thus becoming non-functional as a timepiece. 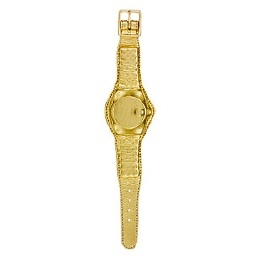 The hidden watch transcends typical associations of wealth or at least the accepted appearance of such by silencing the “bling” and isolating the emerging form. By stripping the user of this visible mechanical aid, one is forced to rely on a sense of personal time or the help of others to determine the hour. Sure, all you Readymade readers out there undoubtedly know how to make your own wallets out of household junk. But you have to admit that the stuff you make never lasts that long before falling apart. Maybe you’re not clever, or maybe you can’t use a sewing machine, or maybe you just don’t see projects through. Who knows what your problem is. What you people who appreciate that crafty aesthetic—but who don’t have the craft-making skills—really need, is somebody to make the stuff for you. Which is exactly what makes db clay so appealing. This Portland, OR-based company makes wallets out of professional-grade gaffers tape, which supports a variety of patterns and images. The company’s original wallets were made from duct tape, and duct tape wallets in a variety of colors (including lime, red, and pink) are still produced. 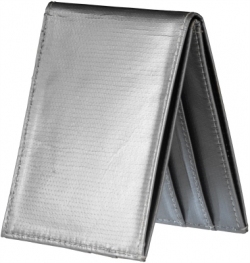 Both sets of wallets feature six interior pockets (four card slots and two card pouches), as well as a single bill compartment. Water-proof interior nylon lining is secured with Teflon-coated nylon stitching, so these things will last longer than anything you’d make for yourself. The model pictured goes for $40, and the others are in that range. The website, again, here. Nothing warms up a room like a shrunken head. As a design piece, it’s really unrivaled in its deft mixture of artistic craftsmanship, juvenilia, and cultural misunderstanding. “Show your contempt,??? suggests Chase Enterprises, the head shrinkers behind this product, “…for gangsters, politicians, terrorists, and snobs…with a museum quality shrunken trophy head.??? We have no idea what it means, either. They go for roughly $400. By productdose on 09/01/05 • Leave a comment! Ever notice how really successful people are always trying to multi-task. It’s really annoying. Particularly if you’re the kind of person who can’t get anything done because you’re always posting on blogs. We’re here to bridge the gap by blogging on this Troika Pocket Calculator/Card Case. This is exactly the type of thing you need when you find yourself performing complex multiplications and schmoozing professionals at exactly the same time. By productdose on 08/24/05 • Leave a comment! The mini Portable Mosquito Repeller just may be—like the manufacturer claims—the world’s smallest and most portable mosquito repellent device. The machine is worn like a wrist watch, and its fan blows mosquito repellent out into your immediate surroundings. Of course, this versatile device can also be attached to a backpack or left freestanding in your room, and there appears to be no mention of harmful effects on the packaging (particularly if you can’t read Japanese). Two AAA batteries run this thing, and one mosquito repellent cartridge inserted into the device boasts 120 hours of mosquito-free bliss. It’ll set you back $14. By productdose on 08/16/05 • Leave a comment! Granted, a carpet floor tile system called Bloody Room doesn’t sound like the most inviting home decorating option, but we’re intrigued by the possibilities. Actually, we don’t want to know what kind of space you live in if this fits your style, so maybe we should leave this one in the conceptual realm. 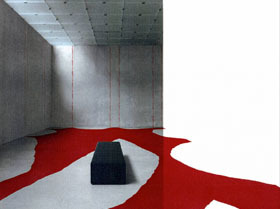 Designed by Jonas Van Avermaet for Tarkett Sommer, the Bloody Room appears to be inspired by violent murder. Each 40 cm by 40 cm tile is designed in one of five different patters that fit together to make variety of pattern combinations. Either that, or you they can be arranged to simply give your floor the look of being covered by blood. Your choice, killer.